THE REVIEW: For longtime readers of this site you’ll know that I’m all over anything NASA or space-related. Even a film like Transformers: Dark of the Moon I gave some extra points just because it included (albeit rather poorly) a large NASA element in the story. So you could expect going into Hidden Figures this was a film made for me, and of course you’d be right. Just at a high level it ticks all the boxes I would want: historical biopic, space-themed, lots of science and numbers, and an all-around wonderful ensemble cast. While there are historical inaccuracies present in the film, most seem to deal with time-shifting events so that they took place during the Mercury missions, rather than earlier. I tend to overlook such inaccuracies because I’d rather have an entertaining film that interests and encourages me to read more about it that a film muddied down in minutiae which make for a less compelling story. 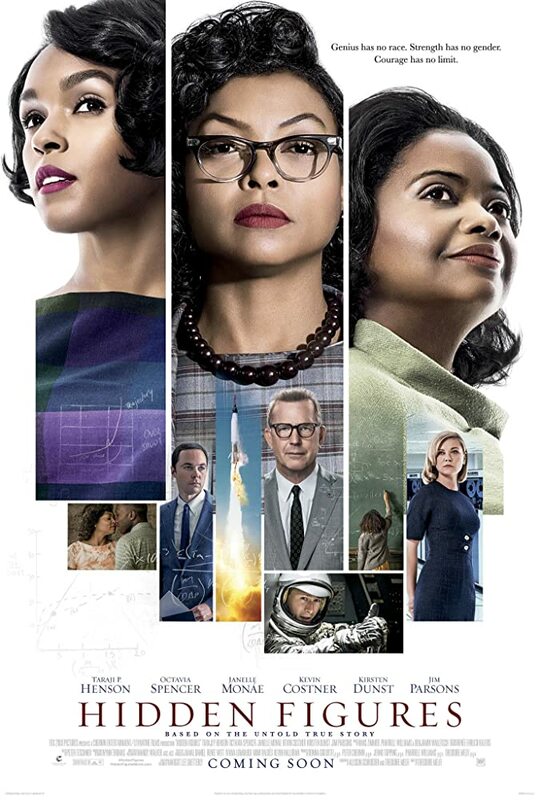 In that vein, I suggest you read the biographies for the three main characters: Katherine Johnson (Taraji P. Henson), Dorothy Vaughan (Octavia Spencer), and Mary Jackson (Janelle Monáe). All of these main three — the hidden figures — as well as the rest of the cast really are phenomenal and deserving of their Screen Actors Guild for Outstanding Cast. I can’t pick out a single weak link in the chain, that’s how good the ensemble is. Hidden Figures isn’t just about the acting though. It also has an historical angle to it with the integration of NASA and upper management recognizing the work of women computers (as in people who compute — it still sounds weird as if they talk about the women as machines with no personality) and in this case specifically, the contributions of three black women who are clearly not treated as equals. (Side bar: this seems to be the biggest historical discrepancy between truth and film. Each of the women were in fact the first people to reach the positions they did, but NASA was integrated from the beginning. NACA, the precursor to NASA was segregated which is where a lot of the personal drama occurred. But in order to make it seem more important, they time shifted it to take place during the Mercury missions). The last piece of praise I would have for Hidden Figures is the representation of space, but you probably fall into one of two camps: 1) you have no interest and anything I say would be boring, or 2) you are a space fan like myself in which you already know the groundwork for a lot of the events. Even so, I learned a lot of new things about the space race through Hidden Figures and would recommend it to anyone extremely interested down to even the remotely interested. If you want a little taste beforehand, I did create a cute little animation for a college class that walks through the major milestone events of the race, if you want a little brush up before the full film.